With the consistent rise in food-poisoning cases and hospital acquired infections, the demand for and usage of anti-microbial coatings is augmenting in healthcare and food-processing industries. Additionally, owing to rising healthcare spending in emerging countries such as India and China, the demand for and usage of anti-microbial coatings are expected to increase during the forecast period. Anti-microbial coatings, owing to their inherent characteristic of inhibiting germ and bacterial development, are used in many industries. Healthcare is the major industry with maximum usage of anti-microbial coatings. It is used majorly on surgical devices as it helps to inhibit the spread of germs and bacteria among patients, doctors and caretakers. As a result, hospitals are now focusing on using medical equipment coated with antimicrobial coatings. Additionally, with growing consumer awareness regarding hospital acquired infections, consumers are opting for hospitals with better medical facilities and equipment. Consequently, making healthcare sector major consumer of antimicrobial coatings. Silver is proven to be the most effective antimicrobial material and has the least toxicity to humans. It was rapidly adapted as a microbial deterrent in the health care. Silver in its ionized form has anti-microbial properties and the non-ionized form is inert. Some of the mechanisms that are proposed for the microbial effect of silver are protein inactivation, DNA association, and entering the cell. Due to these properties, it is extensively used as an anti-microbial agent in wound dressings, cotton fibers, endotracheal tubes, water filtration equipment, glass, food and pharmaceutical packaging, and white goods etc. The preference for anti-microbial coated medical equipment in the United States is increasing due to the various initiatives taken by the government as well as the hospitals in the country to prevent nosocomial infections. Moreover, the United States medical and surgical equipment production is expected to grow by around 5% yearly, which in turn, provides an opportunity for the growth of anti-microbial coatings market in the health care industry. There is also an increase in the application of anti-microbial coatings in public and high traffic areas to inhibit the spread of pathogens that can cause disease in the country. 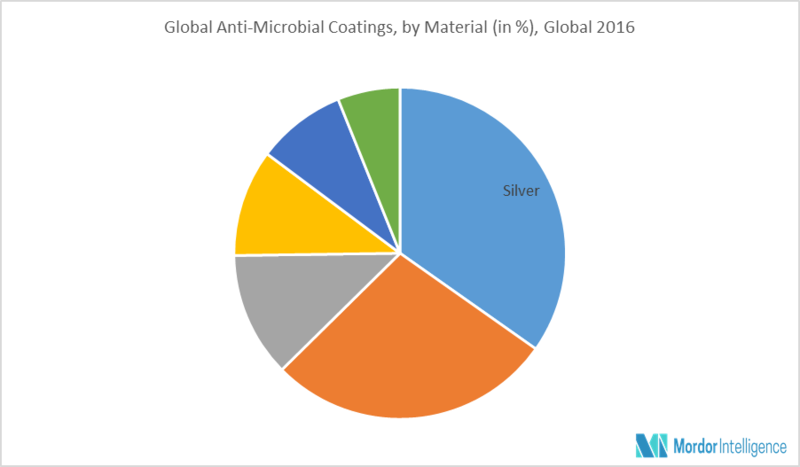 Increasing health care spending of consumers, along with increasing awareness for food safety is pushing manufacturers to opt for anti-microbial coatings to meet consumer needs, which in turn, are propelling the anti-microbial coatings market. October 2017: RPM International Inc. announced that its USL Group had acquired Ekspan Holdings Limited, a provider of movement control products and services for bridges and major structures. 8.10 Mankiewicz Gebr. & Co.
8.17 Specialty Coating Systems, Inc.